Quilt Racks are a fantastic way to display your quilts with pride. There is no reason why you should put your quilts away in the cupboard when you aren’t using them if you can use them to create a homely feel to any room. Quilt racks come in many different shapes, sizes, forms and colors. 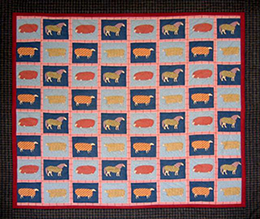 The typical quilt rack is a stand-alone rack with either two or three rods to display two or three quilts. Generally they are made out of wood (stained or natural) or wrought iron. The most popular woods are pine, oak and cherry, although walnut and other woods are also available. All types are perfect for displaying an heirloom quilt. It doesn’t matter if you are a novice, a quilting enthusiast or inherited one from a loved one, your quilting rack is the perfect way to display all your hard work and love that went into your quilt. Whilst the most popular quilt racks are quilt stands, wall hung racks are also popular. These types of racks are fantastic because it means the floor space underneath them is free and can give a room a larger feel. It also means if you hang your quilt rack quite high, that more of your beautiful quilt will be on display. Generally wall hung quilt racks will have a shelf above the rail, to display other little goodies you have in your house and to keep dust off your heirloom. If you have a number of quilts at home that are sitting in the back of the cupboard or in an unused spare bedroom and you are not seeing them as much as you would like to, consider getting yourself a quilt rack. They are a beautiful piece that will add to any room in the house and also let you get the maximum value out of each of your quilts. Interested in building your own quilt rack? Check out quilt rack plans page for more information! 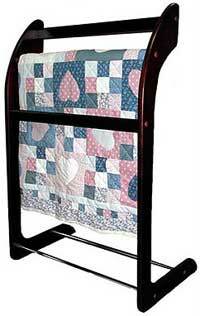 Dress up your bedroom with this luxurious wood and chrome quilt rack . Combining the warmth of mahogany finished wood with the durability of polished chrome. Three rung rack allows for ample storage. This is a beautiful and simply finished quilt rack, perfect for any quilt. A beautiful, timeless piece built to display the family heirlooms, this steel quilt rack will be a prized possession handed down from generation to generation. Built from hammered steel, the quilt rack will hang up to three quilts on the same rack. Perfect for the living room and bedroom, this wooden quilt stand stores and displays quilts and throw blankets. This quilt stand is made from durable solid wood with a warm, walnut finish. The wide frame of the quilt rack provides stability for storing multiple blankets at once.